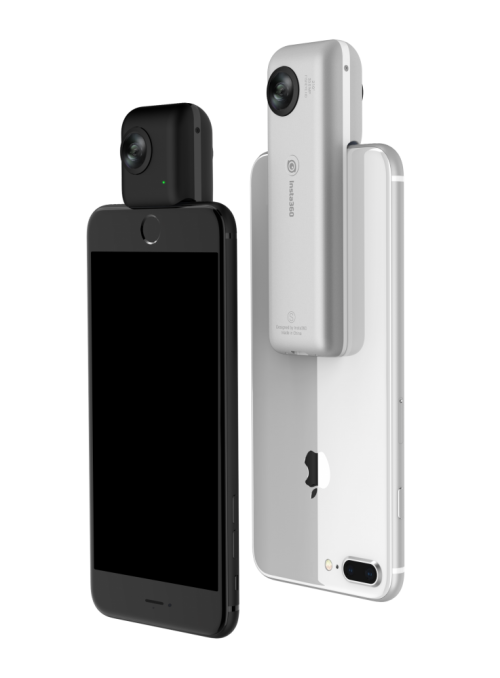 Insta360 has just announced the follow up to its popular iPhone only 360 camera, the Insta360 Nano S. The original Insta360 Nano was one of the first 360 cameras that attached directly to your phone, which makes shooting in 360 causally much more plausible. This new version works in much the same way and looks pretty identical to its predecessor. This Insta360 Nano S features 4K video, 20 megapixel photos and a new video mode called multiview. It seems that Insta360 wants this to be a camera that makes live streaming and video chat more fun and interesting, with little focus on actually shooting in the 360 format. Let’s take a look at the full specs as well as some example footage. The specifications of this camera are pretty much what you would expect of a new 360 camera in 2018. 4K video and live streaming capability are pretty much essential for any new 360 camera to be taken seriously. Does anything stand out? Well for a start there are a few new video modes that let you manipulate your 360 video to create some cool effects, this means you can use your camera to create flat HD video much like the Insta360 One or Rylo. I’m glad to see that the camera features stabilization, although how well this will work when using the iPhone Gyroscope remains to be seen. I’ve found a dedicated gyroscope inside the camera to be more effective. For me, what makes this camera stand out is that it can fit all of these features into such a small package. This is clearly a camera designed for the average iPhone user and not the professional film maker. The specifications are certainly a huge upgrade from the original Insta360 Nano, but is it worth buying? Let’s see if the footage already released is convincing. The footage looks great, but remember that this is a marketing video and it will have been enhanced in some way. The most interesting points to take from this video are the new live-streaming and video chat modes. 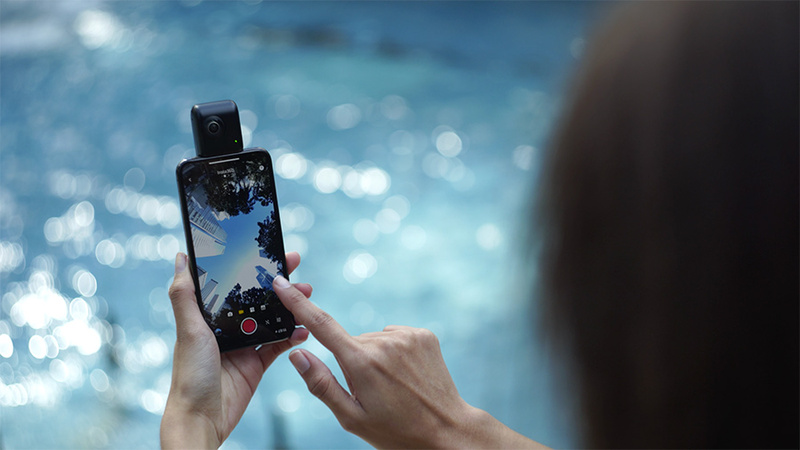 The Insta360 Nano S is only the second 360 camera that allows you to live stream in 360, and the first that allows you to show multiple views at once. This could make sharing your environment when live-streaming a lot more intuitive. He shows the camera in action and with some real time footage. The camera seems to have a lot of video modes that allow you to show one part of your surroundings over another, essentially letting you choose the most interesting points for your viewer to look at. Of course this is all usually done in post editing, the camera is recording in 360 and the software allows you to manipulate it. What makes the Nano S interesting is that some of these features are enabled in live mode while the camera is recording. Here’s another video from a YouTube user who has the Nano S. In this case the user has attached the camera to a selfie stick, and there are some noticeable vibrations when he’s walking. You can see the one lens footage over another in action here. The sequel to the Insta360 Nano. Livestream, video chat and multiview using this 4K 360 camera. While this is a 360 camera that seems to be able to shoot decent quality 360 video, there is very little indication that this is a camera intended to be used for that purpose. 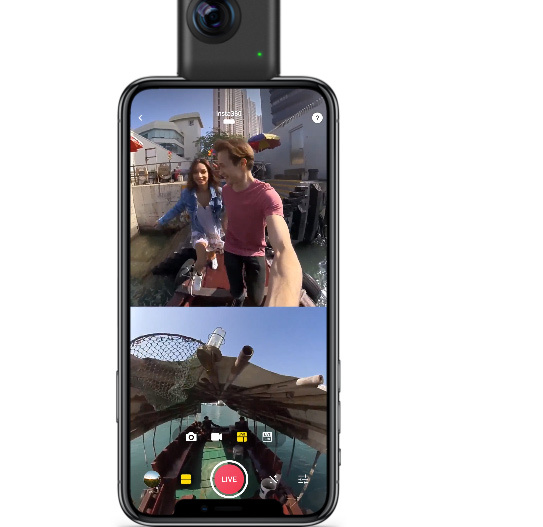 Of course you could just shoot 360 video and upload it as that, and it will probably look fine, but all of the software options and marketing material implies that this is a camera for live-streaming, instagram and video chat. The 360 element simply allows you to create some cool effects and manipulate what your viewer sees much more than would otherwise be possible. The Insta360 website states this as one of the cameras headline features, so what is it exactly. Essentially its splitting your screen into multiple smaller screens and filling them with a different view shot with your 360 camera. You would need multiple normal cameras to achieve a similar effect, but shooting in 360 allows you to do this with just one camera. 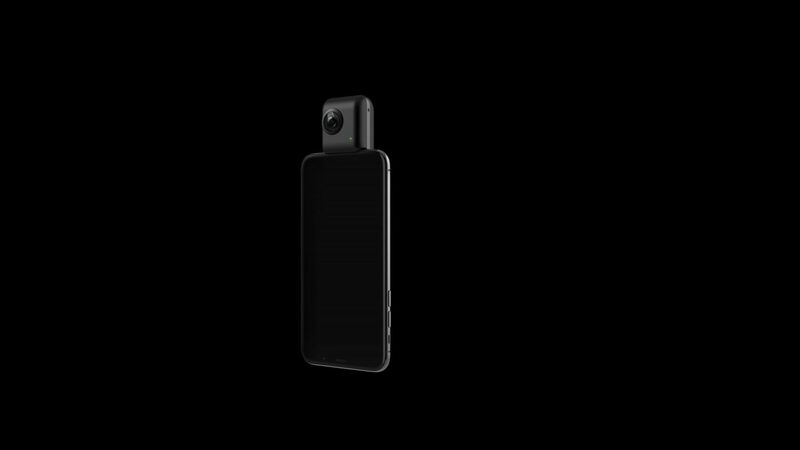 Arguably the other headline feature of this camera is 360 video calling, which is only available on one other 360 camera so far (the Giroptic iO). Why would you want to video chat someone in 360? 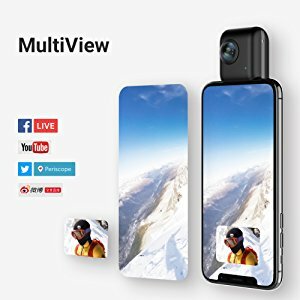 Well for a start you can control what the other persons sees without having to move your phone, so if you happened to be video calling someone in the middle of a mountain range, you could show them the whole view just by sliding your finger across the screen. Whether this proves to be a popular feature remains to be seen. I can see how people travelling might want to share some cool environments with their family back home via video chat, but I can’t see people using it every day. I find that people on Facebook tend to prefer viewing 360 photos rather than video, because the image doesn’t move so the viewer can take their time without worrying they missed anything. It’s therefore great news that the Insta360 Nano S seems to be a decent photography camera as well as video. The sensors have been upgraded to shoot 20 megapixel photos, which is not the best of any 360 camera, but it’s still pretty good. The Insta360 Nano S seem to technically be a 360 camera, but that’s not what it wants to be. If you are primarily interested in shooting in the 360 format and sharing those kinds of videos, then this camera may simply have too many features that you are not going to use. If you want a camera that will allow you to live-stream from multiple angles at the same time, video chat with footage from two screens and create short instagrammable videos with smooth panning motions, then this could be a great option. In comparison with other 360 camera, the Insta360 Nano S seems very similar to the Rylo in its ambitions to be a 360 camera for the masses. Both are targets at young people who like to share a lot of content, whether the Nano S can match the excellent build quality and software of the Rylo remains to be seen. 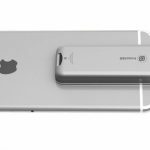 The Insta360 Nano S, like it’s predecessor, is only compatible with iPhone’s. The specific models it’s compatible with include: iPhone X, iPhone8/8 plus, iPhone 7/7 plus, iPhone 6s/6s plus, iPhone 6/6 plus. No word on an Android version yet, however last year Insta360 released a completely different camera for android called the Insta360 Air. No doubt a follow up to this model is also in the works with similar features. The Insta360 Nano S will cost $235 and is available now on Amazon. The price of the camera is significantly higher than the original Nano, and is only $65 cheaper than the superior Insta360 One.This is still a fairly reasonable price for a 4K 360 camera with avast array of video modes and the ability to video chat in 360. 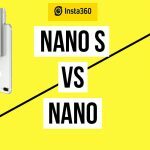 Insta360 Nano S vs Insta360 Nano: What's changed?